In this tutorial, learn how to use Xamarin Forms and Microsoft Azure Functions to develop mobile apps that are supported by serverless functions. 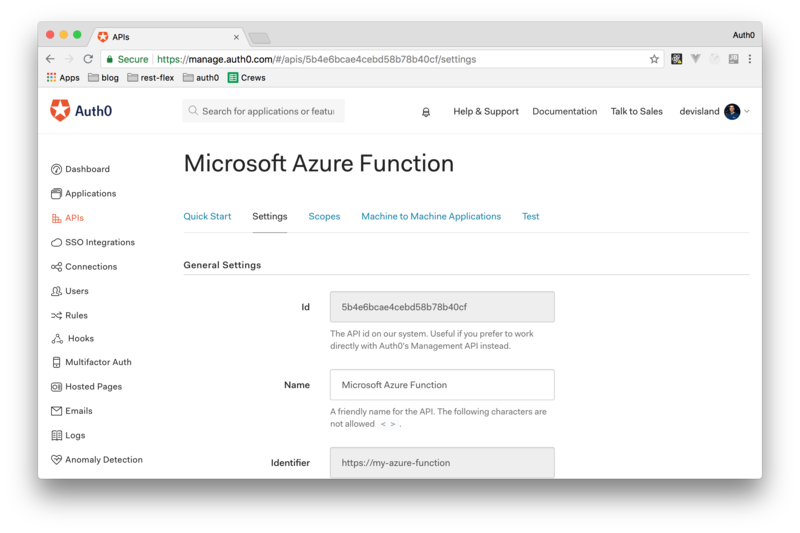 TL;DR: The Microsoft Azure Functions is a solution which enables developers running small serverless pieces of code (functions in the cloud) without worrying about a whole application or the infrastructure to run it. They can be used as a backend for web or mobile applications. In this article, we will present how to access an Azure Function secured by Auth0 from a Xamarin Forms application. If needed, you can also check this GitHub repository to get more information. "Learn how to develop modern applications with Xamarin Forms and Azure Functions." and Software as a Service (SaaS). Microsoft Azure is available through a web portal where all mentioned components can be created and configured. 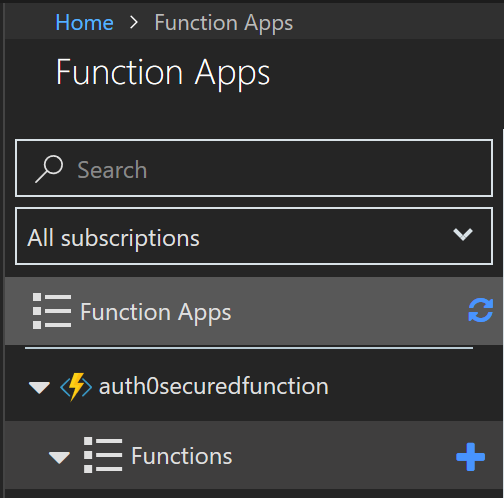 In this article, we will use Azure Functions: a PaaS solution that enables developers running small pieces of code without bothering about the whole application or the infrastructure to run it. Creating an Azure account is free of charge but you have to provide some credit card information. There will be no charge, except for a temporary authorization hold. Microsoft offers $200 credit for starting to explore services for 30 days. If you decide not to upgrade at the end of 30 days or once you've used up your $200 credit, any products you’ve deployed will be decommissioned and you won’t be able to access them. You will not be charged and you can always upgrade your subscription. HTTPTrigger—Triggers the execution of a function code on HTTP requests. TimerTrigger—Executes cleanup or other batch tasks on a predefined interval. QueueTrigger—Respond to messages as they arrive in an Azure Storage queue. In this article, we will use the HTTPTrigger template to create our Azure Function. This function will be secured by Auth0 so, before accessing it, users will have to authenticate. These users will use (and authenticate through) a Xamarin Forms application which will then submit requests to our Azure Function. "Azure Functions enables developers running small pieces of code without bothering about the whole application or the infrastructure to run it." Click the "Create a resource" button in the left top corner. Type "Function app" in the search window. Select "Function app" from the list. App name: This will be the name of the Azure Function. You can add something like "auth0-function-app". In my case, I used "auth0securedfunction" but you can't use the same as the name has to be unique. Subscription: This is the type of the subscription that you have. Resource group: This will be the group where function app will be located. You can select "Create new" and type "function-app-rg". OS: As the host operating system, you can select "Windows". Hosting plan: You can set it as "Consumption Plan" so you pay only for the number of executions. Location: It is a good idea to create the function in a region near you. Storage: Some functionalities connected with Azure Functions require storage. You can just select "Create new" and leave the name as it is. Once you fill all the required information click the "Create" button. After a short time, the Function App will be created and notification will show up. After that, select "Function App" from the left bar. A blade with the created function app should appear. Expand it and move the mouse cursor on the "Functions" header and click the "+" button. Another blade with templates will be displayed. From there, choose "HTTPTrigger C#" template, fill the name field with "Auth0FunctionApp" and change authorization level to "Anonymous". After a few seconds, the HTTPTrigger function will be ready for you. Once the NuGet package is installed, proper information will be displayed in the Logs console. As you are going to use Auth0 to handle authentication, you will have to sign up to it. If you don't have an account yet, you can sign up for a free one here. To represent your Azure Functions on Auth0, you will have to create an Auth0 API. So, open the "APIs" section and click on the "Create API" section. Auth0 will show you a dialog where you will have to provide name for your new API (you can input something like "Microsoft Azure Function", an identifier (in this case, you can input something like https://my-azure-function, you will need it later), and a signing algorithm (you can leave this as RS256). Then, click the "Create" button and, after a few seconds, you will be redirected to the Quick Start section of the API just created. From there, you can click on the Settings tab to copy the Identifier (also known as audience) of the API. You will use this value in the Azure Function source code to validate access_tokens. As mentioned, access to the Azure Function will be secured by Auth0. As such, users have to authenticate in the Xamarin Forms application to then send requests with the access_token to the function. Here, OpenID Connect will be used to verify user identity and, once it's confirmed, a response with greeting will be returned. So, now, you will have to open the run.csx file from the "View files" tab on you Azure dashboard. This is the place where the function source code should be placed. Let's discuss it. Note that we are using logger here to display information in the Logs console. And that's it. This is how your serverless function works. You will use this URL in the Xamarin Forms application so copy it for the further usage. 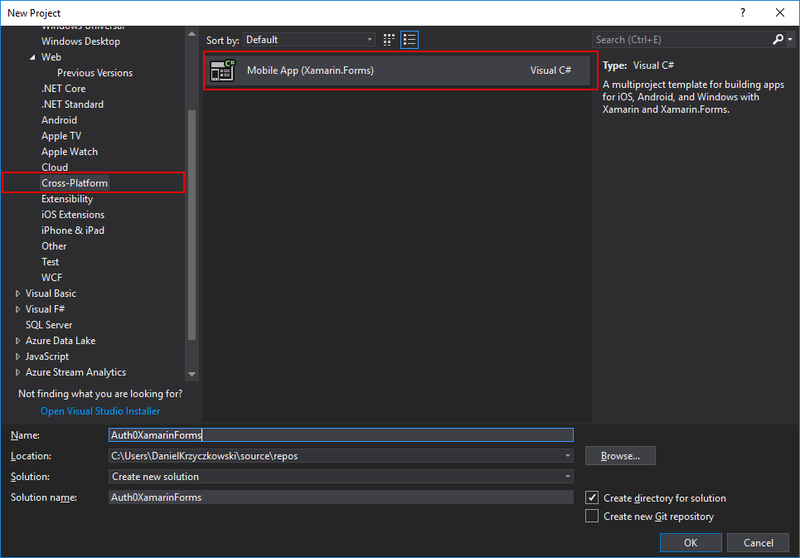 Remember to select Mobile development with .NET during Visual Studio 2017 installation so you can access Xamarin cross-platform project templates. The first three projects contain specific platform code and the Core project is where common logic (shared by other platform specific projects) should be placed. Auth0.OidcClient.Android: you will use this NuGet package to integrate Auth0 in your Android application. Auth0.OidcClient.iOS: you will use this NuGet package to integrate Auth0 in your iOS application. Auth0.OidcClient.UWP: you will use this NuGet package to integrate Auth0 in your UWP application. RestSharp: you will use this NuGet package to issue HTTP requests to your serverless Azure Function. All Auth0.OidcClient packages provide authentication functionality so users can sign in or sign up through your Xamarin Forms applications. The RestSharp package will be used to connect your Xamarin Forms apps with you serverless Azure Functions through HTTP requests and to handle the responses. After installing these packages, your project structure will be ready. An Auth0 Application represents your client apps (in this case a mobile app) on Auth0. So, first, you will need to define the Application on Auth0 to then be able to add authentication in your Xamarin Forms application. To create an Auth0 Application, go to the Applications section of your Auth0 dashboard and click on the Create Application button. In the dialog that the dashboard presents, you have to provide the name of the new application and choose an application type. For the name, you can add something like "Xamarin Forms App" and for the type you will have to select Native. After inserting the name and choosing the type of the application, click on the Create button and, after few seconds, you should be redirected to the Quick Start section of your new application. From there, click on the Setting tab and leave the page open. Soon, you will need to copy the Domain and Client ID values to use in the Xamarin Forms application project. Let's start by adding a new folder called Config in the project root directory. Inside this folder, you will place two static classes: * AuthenticationConfig: a class which will contain your Auth0 configuration (i.e. the audience, the client ID, the and domain retrieved from your Auth0 dashboard). * AzureConfig: a class which will contain the URL of the Azure Function before. Now, you will have to populate the fields above with the correct values. Both the Domain and ClientId fields can be populated with the info that you find in the Auth0 Application that you just created. The Audience will be the identifier of the Auth0 API that you created a few moments (e.g. https://my-azure-function). If you don't remember, go to the APIs section of your dashboard and check the value that you entered while creating your API. Be sure to input the URL of your Azure Function in the AzureFunctionUrl field. IAuthenticationService: an interface with the Authenticate method and the AuthenticationResult property. This interface will be implemented in each platform project: Android, iOS, and UWP. 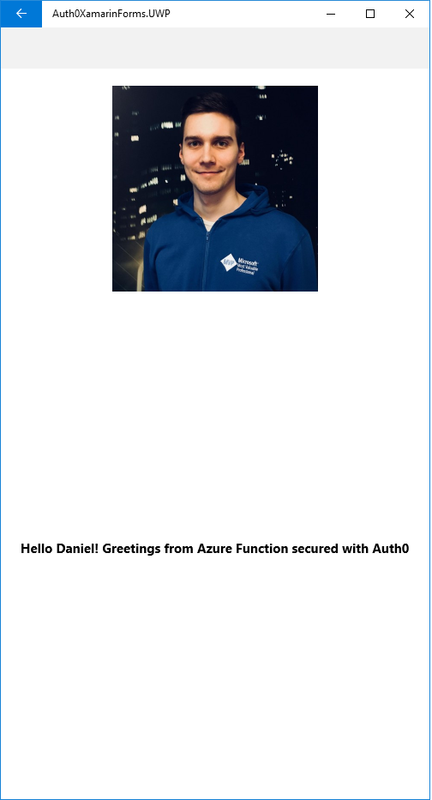 IAzureFunctionDataService: an interface with the GetGreeting method which will be implemented to obtain greetings from your Azure Function once the user is authenticated. Now it's time to implement the user interface of the application. So, create a folder called Pages in the Core project and then add two content pages: LoginPage and MainPage. To achieve, this right click on the folder, select "Add" then "New item" and select "Content Page". Now, as mentioned earlier in the article, you will need to implement the IAuthenticationService interface in each platform project (i.e. iOS, Android, and Universal Windows Platform). In the Services folder, create a new class called AuthenticationService. This class will be responsible for handling the authentication process on Android. Please note that you will be using dependency injection to register the IAuthenticationService implementation. Note: You will have to replace YOUR_ANDROID_PACKAGE_NAME in the code snippet above with your own Android package name. If you don't know what is your package name, check this. After that, you will have finished creating your Android Application Project. Now, inside the Services folder, create a new class called AuthenticationService. This class will be responsible for handling the authentication on the iOS platform. Please note that you will be using dependency injection to register the IAuthenticationService implementation. This class looks exactly the same as in your Android project but here you are using a different NuGet package: Auth0.OidcClient.iOS. Be sure to replace YOUR_APPLICATION_PACKAGE_IDENTIFIER with the Bundle Identifier for your application, such as com.mycompany.myapplication. After that, your iOS application will be ready. That's it. 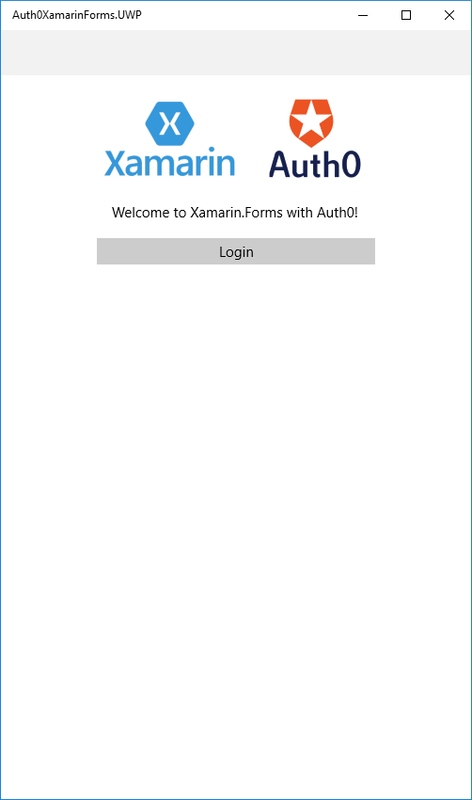 Now you have implemented user authentication in the different projects (iOS, Android, and UWP) of your Xamarin Forms app and you are ready to integrate both your mobile app with your Azure Function. Once the application user interface is ready, we have to integrate it into your Azure Function. "I just developed a mobile application with Xamarin Forms that communicates with an Azure Function." In this tutorial, you learned how to develop a simple Xamarin Forms application that communicates with a serverless Azure Function. Both applications built throughout the article (the mobile app and the serverless function) are quite simple, but they give you enough knowledge to build more-complex applications while following an approach that is modern and secure at the same time. If you have trouble while following the article you can always check the original GitHub repository that I've created while writing and you can get in touch through the comments section down below.